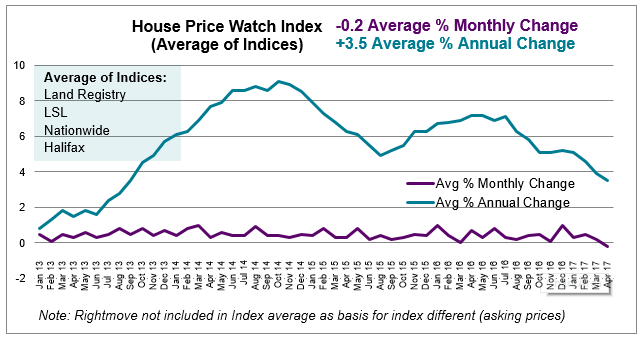 May 2017 House Price Watch indicates that house prices have fallen for the first time in years -- on average 0.2% in the past month and average annual house price growth slowed further to 3.5% ; the lowest average annual rate of house price growth since September 2013. 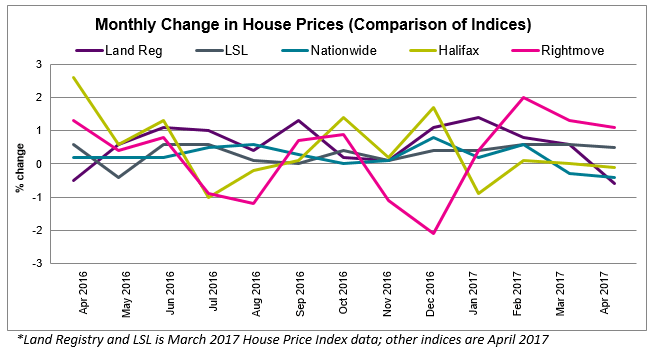 Most of the major indices report a decline in monthly house prices: -0.6% Land Registry (March data), -0.4% Nationwide (April data), -0.1% Halifax (April data). 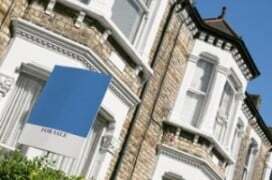 LSL reports house prices to be up 0.5% (March data) and Rightmove report a rise of 1.1% in asking prices in April. UK home sales decreased by 3.2% between March and April 2017; Transactions are up year on year but transactions in April 2016 were unusually low given the introduction of higher stamp duty rates on additional homes. (HMRC seasonally adjusted figures). The April 2017 RICS UK Residential Market Survey results show sales declining slightly over the month. New buyer enquiries and new instructions from sellers weakened further. House prices have fallen in most regions of the UK over the past month. 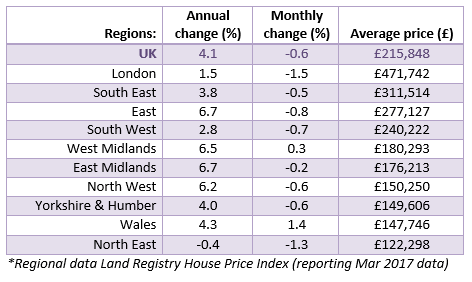 The biggest reductions are evident in London (monthly house prices dropped 1.5% and annual house price growth is 1.5%) and the North East (house prices dropped 1.3% in the past month and annual house price growth is 0.4%).